16-Piece Knife Set Just $44.98! Down From $140! PLUS FREE Shipping! You are here: Home / Great Deals / Amazon Deals / 16-Piece Knife Set Just $44.98! Down From $140! PLUS FREE Shipping! Don’t miss this amazing deal from Amazon! Grab this DEIK Classic 16-Piece Knife Set for only $44.98, down from $139.99, PLUS FREE shipping! 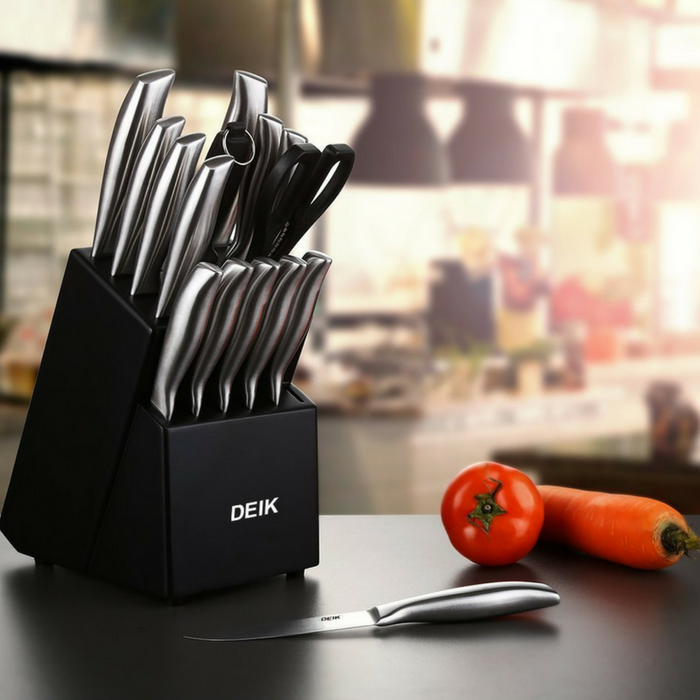 The DEIK Classic 16-Piece Knife Set carries a useful assortment of standard knives for outfitting a kitchen. It features an attractive and robust, sharp, and always ready-for-use knives. The knife blades are made from high carbon super sharp stainless steel, provide high durability and rust resistance. All knives store safely in the durable pine wood knife block and knife sharpener included to keep your knife always in excellent condition! Premium Quality Kitchen Knife Set: Knife blades are made from high carbon super sharp stainless steel, provide high durability and rust resistance. One Piece Knife: Knives are forged continuously in a single piece, it eliminates any chance for bacteria to enter into the handles or fissures, for healthier living at affordable costs. Easy Care: All knives store safely in the durable pine wood knife block and knife sharpener included to keep your knife always in excellent condition. Ergonomic Design: Curved and Tapered hollow handle design delivers great weight balance and prevents cutting fatigue, fit perfectly in hand and ensure comfort when cutting, slicing.